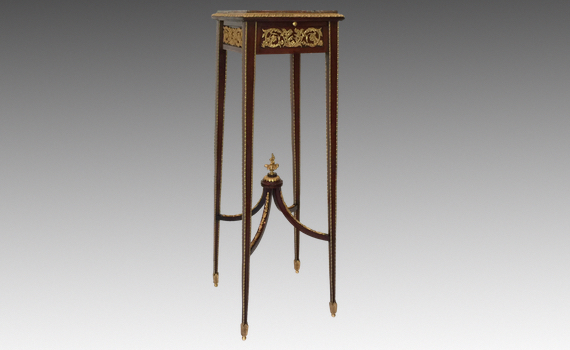 A late 19th century, French, mahogany and gilt bronze mounted stand or gaine. The square marble top inset a gilt rim, above four panelled sides centred by acanthus cast scroll mounts with a single frieze drawer and opposing slide. The slender four tapering legs, edged in ropetwist, united by an upswept stretcher surmounted by a floral finial. Mounts regilded. A possible attribution to Linke through the frieze mounts and drawing in day books index number 56.